We have a well stocked ships store that is open Monday through Friday from 8:00 AM until 4:00 PM year round. Our store is also open from the first Saturday in April until the last Saturday in September from 9 AM to noon. 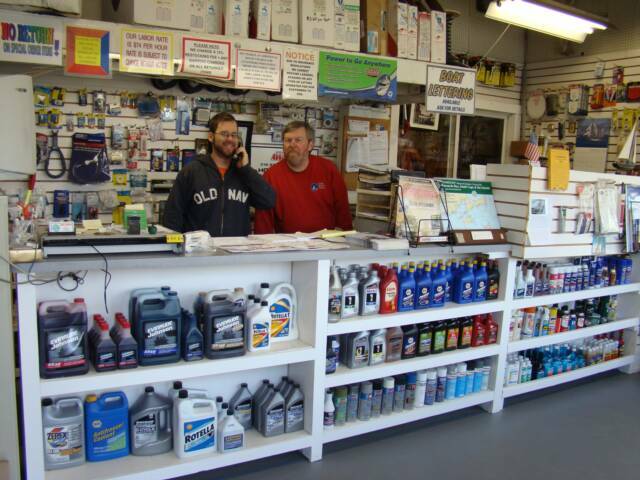 Our Store is stocked with all of the most popular boating supplies as well as necessity items. Ice, hats, T-shirts, safety items, magazines and tide charts are just a few of the hundreds of stocked items. We are an Achilles dealer and offer the entire line of fine inflatable's and parts. We are also dealers for Perfect Pitch Propellers. We also stock most of the everyday parts for your boat. If we don't have what you need, we can usually get it in a matter of days. We can provide next day delivery on most items. Additional services available through our service department include but are not limited to propeller reconditioning, canvas and sail refurbishing or repair, rigging services and boat lettering.